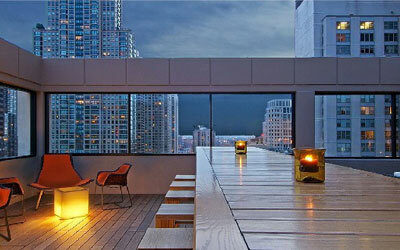 VERTIGO SKY LOUNGE is one of the two most upscale bars on this list! The view is really unrivaled by any other. If you want to feel like you are miles above the bustling city, enjoying luxurious mixed drinks and imported beer and wine, and watching the world go by without a care, then this is your go-to spot. It's all about the ambiance here. It sits atop the Dana Hotel & Spa, and note that the entrance is not inside the hotel, but rather on the side. Don't miss this place when you're in town!